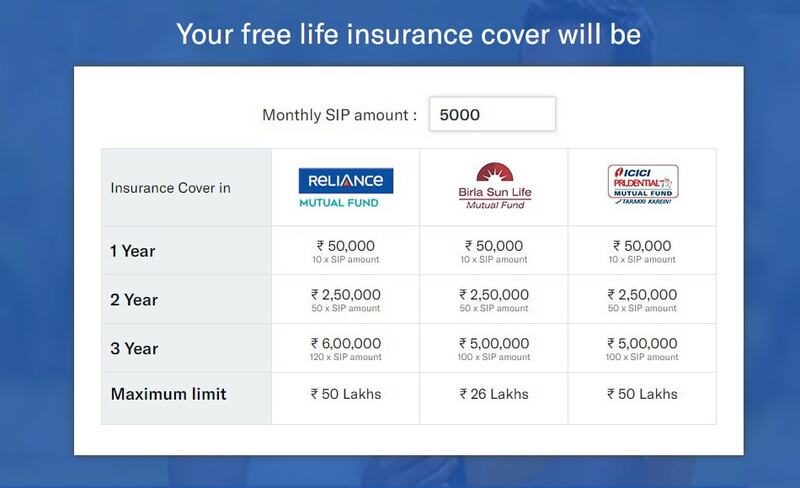 Know all about SIP with Insurance plans by going through this write-up. Buying insurance is a tricky chore, it’s not like an ordinary shopping experience of a utility, it’s more like buying a promise for oneself. A promise that no matter what happens, there will be your insurance to offer a financial cushion to your loved ones. Thus, it should be a vital part of one’s financial planning. Mutual fund industry is coming up with new products to provide the best investment experience to investors, and several AMCs have launched products which include the benefits of SIP with Insurance. In the list of major fund houses, ICICI Prudential MF, Reliance Capital AMC, Aditya Birla Sun Life MF were a few of the major names who have introduced the idea with some of their schemes. Seeing the growth prospect in the idea, we, at MySIPonline, have recently come up with the facility of SIP insure on our online portal as well. Let’s know all about SIP with insurance, what benefits one can accrue from these plans and is it suitable for you or not. Often called by different names such as SIP Insure, SIP Plus, Century SIP, such schemes have been in the market for a while now, but are indeed making a comeback after LTCG. Currently, ICICI MF, Reliance AMC, and ABSL MF have been providing an add-on facility of life insurance cover for the investors who take the way of SIP to build wealth. Though they come up with certain conditions with the same, it’s indeed a good facility of which the investors can take benefit. Such plan will be a group insurance and not an individual one. Besides, the least tenure for which the SIP has to be active is 36 months, and the facility can be availed on a selected schemes only. As you decide on the amount for which you want to start a SIP, then the life cover in the first, second, and third year onward will be a specific multiple of that particular amount, which could be ten times, 20 times, and 30 times, respectively. Let’s understand the procedure with the help of an example. Consider the monthly SIP amount to be Rs. 10k. Now, as per the above statement, the life cover for the 1st, 2nd, and 3rd year will be Rs 1 lakh, Rs 2 lakh, and Rs 3 lakh, respectively. Who Can All Invest in Such Funds? Anyone who lies in between 18 to 51 years of age can enroll to invest in such plans. If there are multiple holders in a scheme, then only the first unitholder will be eligible for the insurance coverage. For SIP with insurance plans, there will be no need for the medical test reports, but a declaration of good health is essential. It can be assumed as a form of a group term insurance where the mortality charges to provide for the protection is borne by the AMC itself. The nominee will directly get the death claim made by the life insurance directly. The maximum amount of life cover a person can get by investing in such plans vary according to the fund house; it can be Rs 21 lakh, Rs 25 lakh, or Rs 50 lakh depending upon the choice of scheme, plan, and folio taken. Furthermore, even the maximum age until when the coverage is provided various, which can be either 55 or 60 years with no upper limit for the SIP tenure. Investors can even go for the option of Perpetual SIP; however, the insurance cover ceases as soon as the investor attains 55 or 60 (depending on the fund house) years of age or when the committed tenure selected by the investor reaches maturity. What if the Investor Decides to Drop Mid Way? With a mutual fund option by your side, people can enjoy the benefit of liquidity by investing in such plans as well. One can stop SIP anytime without necessarily completing the originally decided tenure. If you don’t want to bear the additional expense of exit load, it would be advisable to exit after three years from the date of allotment of the units. If the exit is made within one year, then the exit load of 2 percent of applicable NAV of the scheme will be charged; however, if the units are redeemed before three years but after completion of 365 days, then 1% exit load will be charged. Partial withdrawals, full exit or stopping of SIP will result in the ceasing of the life insurance cover. One of the most significant limitations of such plans is that not all schemes will be eligible for SIP with insurance facility. Thus, if you want to invest in such a scheme, check that the selected plan is performing consistently well and has a good long-term track record. If the performance doesn't seem satisfactory, exit, do not stay invested just for the free insurance cover. Besides, sector or thematic funds should be strictly avoided. As we have stated earlier, the life cover ceases even when an investor makes partial withdrawals. So, he/she has to carefully enroll for such a facility and link it to a specific long-term goal. For more guidance on the same, connect with the experts working at MySIPonline. We will be happy to serve you with all our might.